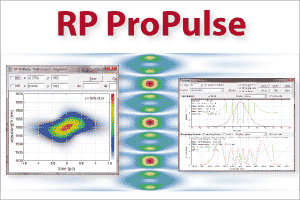 Software from RP Photonics for modeling of fiber lasers, amplifiers, resonator design, etc. You can minimize the cost of product development. You can minimize time to market. e.g. with improved performance and reliability. e.g. for improvements or for new products. You will increase your general technical competence. In short: make progress, have fun, save money! get all the guided modes of the fiber calculated – with effective refractive index, effective mode area, mode profile, etc. 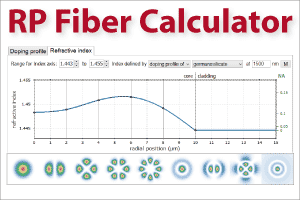 RP Fiber Calculator is a great tool for quick calculations on fibers. Although it is not as powerful and flexible as RP Fiber Power (see below), for many it will a very convenient helper in everyday work on fiber optics. We offer the basic version of RP Fiber Calculator for free, and sell licenses for the enhanced PRO version. Although some of the above mentioned functionality is available only in the PRO version, the free version is already a really helpful tool. numerically propagate light fields through fibers and other waveguides, which may have arbitrary index profiles, variable bend radii, taper regions, multiple cores, lossy regions, etc. reveal the operation details of fiber couplers, fiber interferometers, etc. 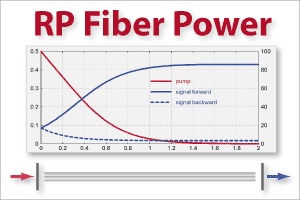 RP Fiber Power is an important tool for understanding and optimizing performance details such as bend loss, coupling effects, amplifier gain, noise figure, feedback sensitivity and power efficiency. It can be used even for most sophisticated level schemes (e.g. in upconversion lasers) and also for bulk lasers and amplifiers. The tool is extremely flexible due to its built-in script language. 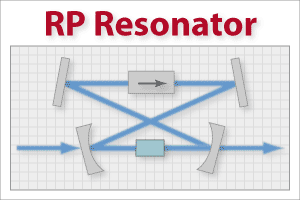 RP Resonator can be used for designing optical resonators, in particular laser resonators. It can not only calculate a wide range of properties of such resonators (such as the variation of beam radii, the sensitivity e.g. to thermal lensing and misalignment, dispersion from geometric effects, etc. ), but also allows sophisticated optimizations. For example, RP Resonator can be used for designing laser cavities which simultaneously meet a number of requirements, such as given mode sizes at certain positions, minimum sensitivity to thermal lensing and misalignment, minimum effect of aberrations on the beam quality, etc. You will hardly find a similarly flexible resonator design tool on the market! A wide variety of effects can be treated, including various kinds of optical nonlinearities, so that even extreme processes such as supercontinuum generation in photonic crystal fibers can be simulated. The very flexible user interface allows the user to quickly define the problem, generate output in the form of any kind of diagrams (including time/frequency plots and spectrograms), import or export tabulated data, do sophisticated evaluations (for example, statistical processing for extracting noise properties), etc. Its flexible user interface makes it easy to define multilayer structures in various ways. A great variety of properties of the structures can be calculated, including reflection and transmission amplitudes and phases, chromatic dispersion, internal field distribution, etc. 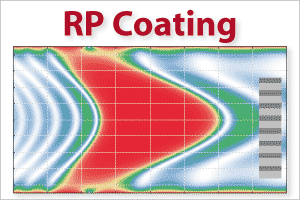 Finally, RP Coating allows for sophisticated numerical optimizations. RP Q-switch can simulate the evolution of optical power and gain in Q-switched lasers (including bulk lasers and fiber lasers) and in subsequent amplifier stages. This software is controlled via forms. 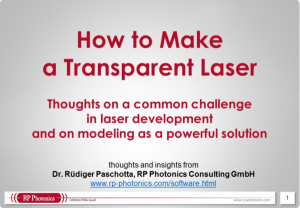 You don't actually need to buy a license for such software, but can also have the software applied at RP Photonics and buy only the generated results in the context of technical consultancy. All our software runs under Microsoft Windows (XP or later), but not in virtual machines. We normally deliver a 32-bit software version, which runs on 32-bit or 64-bit Windows version. On request, we deliver a 64-bit version, which requires a 64-bit Windows version. In most cases, the hardware requirements in terms of CPU speed, main memory and harddisk space are quite moderate, but in some cases it can be helpful or even necessary to have at least 4 GB of main memory and a fast CPU. The underlying equations are based on a very decent physical understanding and the knowledge of relevant scientific literature. The software design has been carefully planned from the beginning, enabling e.g. easy future expansions without changing the concept. The programs have been carefully validated in many details, e.g. by comparison with analytically calculated results for special situations, or by detailed comparison with results from other researchers. The user interfaces are so flexible that it is never necessary to include project-specific details in the source code. Instead, the user can develop scripts to implement even the most sophisticated simulations and optimizations. The software comes with carefully made comprehensive documentation. Users obtain high-quality technical support. Before you try to develop such software yourself, consider the risks associated with required development time (always more than originally expected! ), non-ideal algorithms (compromising accuracy and/or computation time) and errors (possibly misleading your development team). And note that software is only one requirement for numerical modeling: even more importantly, you need a detailed physical understanding, knowledge of possible approaches and mathematical techniques, experience concerning how to make a model useful, etc. Having a real expert for such jobs is certainly worth a lot. If you are interested in software, subscribe to the informative RP Photonics Software News! The development and the technical support are done by an internationally known expert with a particularly detailed expertise. The technical support can not only be used for directly software-specific issues, but also for related technical and scientific questions. The software (except for RP Fiber Calculator) is extremely flexible due to a built-in script language, so that it can be used even for most sophisticated calculations. other calculations in optics, e.g. concerning material dispersion, interferometers, Kramers-Kronig relations, etc. If you are interested, contact RP Photonics to find out what can be done.